Condors are majestic creatures. The California Condor, which historically ranged across the West Coast and Southwest (and even to Florida way back in the day), is the largest land bird in North America. In the late 1980s the California Condor went extinct in the wild, due to poaching and various types of environmental destruction. Successful captive breeding programs have bolstered the population to around 400, over half of which roam freely in the wild. 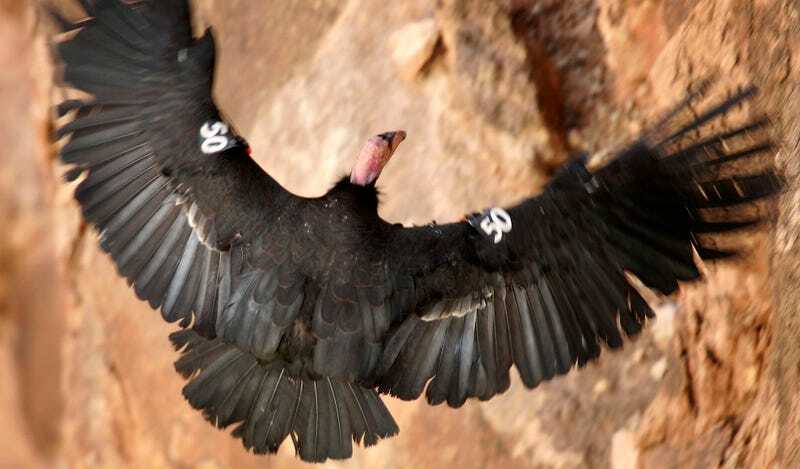 Just because the California Condor is no longer on the brink of extinction, that doesn’t mean that the long-term future of the species is anywhere close to secure. One of the biggest threats comes from the expansion of oil and gas drilling, including fracking, in places like the Los Padres National Forest. Condors are a good—and frankly underused—mascot for sports teams and schools, like Canyon Middle School, which this author is a proud alumnus of. It is also the mascot for minor league hockey’s Bakersfield (Calif.) Condors, formerly of the ECHL. You may remember when their live Condor terrifyingly got loose during a game a couple of seasons ago.